The mouse as a symbol for easy childbirth and prosperity of the family. 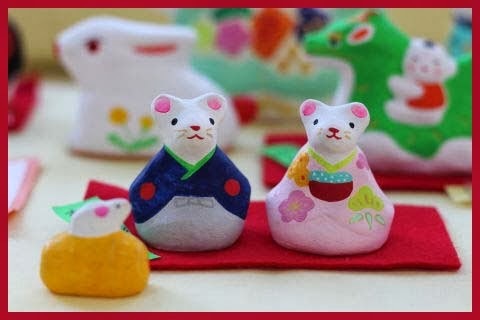 This couple is a present for a wedding with the wish for a long family line.
. Ne 子 / nezumi 鼠　Rat, Mouse . Once upon a time, there lived a wealthy mouse family. 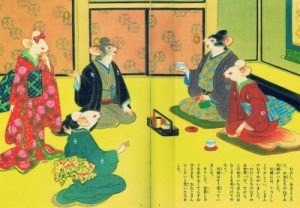 Their only daughter was a good-natured young mouse, and Father Mouse and Mother Mouse were very proud of her. 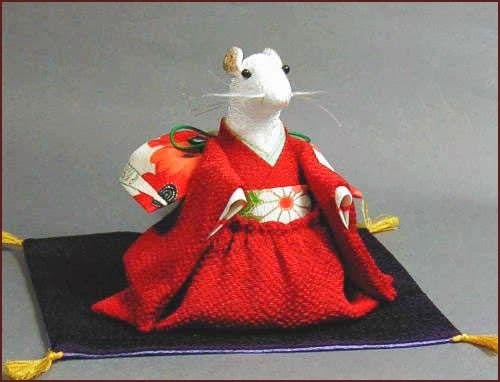 One day Father Mouse said to Mother Mouse, "Wouldn't we want our daughter to marry the best person in the world? Who could be the greatest in all the world?" Mother Mouse replied, "It must be Mr. Sun. He lights up the whole world from high up in the sky." So Father Mouse and Mother Mouse visited Mr. Sun and said, "Mr. Sun, Mr. Sun, we beg you. You are the greatest person in the world. Will you marry our precious daughter? Our only daughter is most good-natured, and we want her to wed the very best groom." But Mr. Sun answered, "Hmm. The greatest person in the world is surely not myself but Mr. Cloud. However hard I may try to light up the world, I am easily hidden away when Mr. Cloud comes out." 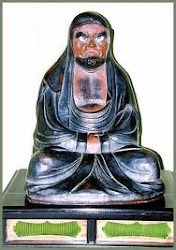 This famous story is also a theater performance. 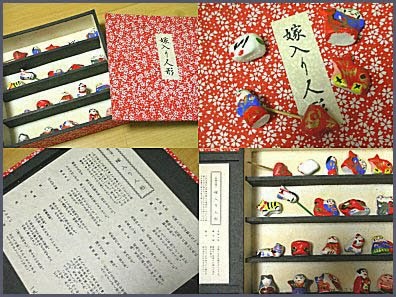 Hand-twisted clay dolls 練り物製 made by Oosaki Toyogoroo 大崎豊五郎 san. 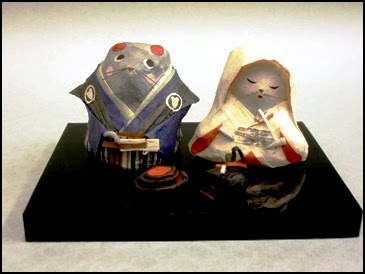 A type of Takamatsu dolls, which he studied to make these dolls as a mix from clay and papermachee. After a bride had spent the night in the new home, children came to the door the next morning to welcome her and she had to give them these small dolls in exchange. The more the better for her, so sometimes a family bought up to 4.500 dolls. 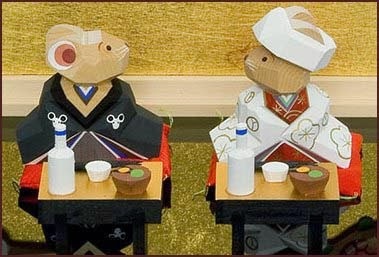 Most dolls were a pun with medetai　めでたい　auspicious for good luck in the future. 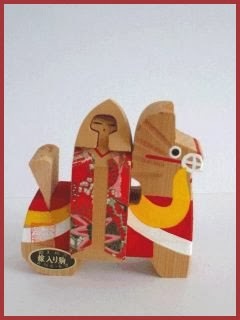 There dolls were also displayed on the seasonal festivals for children in March and May.
. kitsune no yome-iri　狐の嫁入り spell of sunshine during a rain . literally: The Fox is taking his bride home. 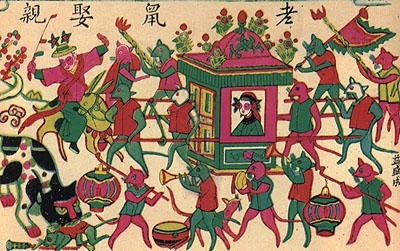 A fox-wedding party. 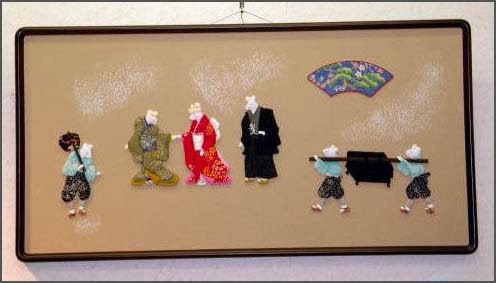 Legends and art in Japan.
. Sweets for the Bride (oiri, o-iri おいり)　from Sanuki .